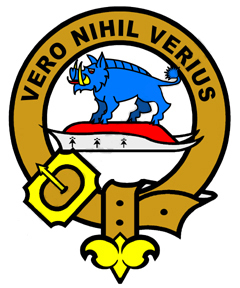 The Scots Connection Clan crest viewer features authentic professionally drawn Clan crests as registered at the Public register of all arms and bearings in Scotland (The Lyon Register). Where no current chief exists we have used the crest of the last registered head of the Clan. To view your Clan history, crest and motto select from the relevant links to the left. The tribal instinct is as old as mankind. The Holy Bible tells us that we are all of us members of the family of Adam. Throughout time, individuals with distinct ancestral bonds have banded together for social and defensive reasons. The Scottish Nation, which came together between the 6th and 14th centuries, was to absorb many immigrants in the process of its creation. The early Scots, who journeyed across the Irish Sea to settle in what was then called Dalriada, were a Celtic people whose distant origins lay in the Middle East. From their West Coast kingdom they of necessity engaged with the Picts, the indigenous inhabitants of the East Coast. Pictorial carvings and standing stones exist from their time, but by the 7th century their cultural identity had largely disappeared. From the far North came Viking hoards from Scandinavia, hungry for land until finally stopped at the Battle of Largs in 1263. To the South, Strathclyde Britons, Saxons and Northumbrians made rapid inroads into Berwickshire, Dumfriesshire, Galloway and the Lothians. Following the Norman Conquest of England in 1066, waves of fortune hunters arrived to make their mark. As trade with mainland Europe increased, merchants from Germany and Flanders appeared in the estuaries of the Forth and Tay. It might seem improbable in this present age, but between the 10th and 12th centuries, Scotland was THE place in Europe where younger sons of the English and continental hierarchy came to seek advancement from the Scottish monarchy, to acquire land and to breed new dynasties. The Clans of Scotland, however, in their true and unique context, did not come about until after Robert the Bruce, himself of Norman descent, had beaten back the English invasion which began in 1296, thus unifying Scottish interests against those of English imperialism. It was his great victory at the Battle of Bannockburn which truly consolidated Scotland's sense of National identity, even though by then the majority of its ruling class was of Norman blood. Of course, some of the same problems as before still existed. A century -and-a-half earlier, Robert I's great-great-great-great grandfather, David I (of ancient Scottish and Saxon blood), had ruled over a prosperous realm governed largely through the Church. But the Highlands were a law unto themselves and, for his successors, the greatest threat to stability emanated from the might of Clan Donald, descendants of the mighty Somerled. This 12th century leader of the Western Isles, had not only taken a great northern heiress as his first wife, but, as his second wife, the King of Norway's daughter. Somerled claimed descent from Conn of the Hundred Battles, Ard Righ of Ireland in the first century AD, so his Royal associations to his mind were equal to anyone, including the King of Scots. It was Clan Donald which therefore led the way towards the creation of the Clan System. From Somerled descended not only the several branches of Clan Donald, but also the MacDougalls of Argyll and Lorn, Clan Alister, and the MacDonnels of Antrim in Ireland. Fiefdoms soon sprang up the length and breadth of the land. By the end of the 14th century, the Highlands and Islands of Scotland were populated throughout by identifiable clan co-operatives. The Chiefs of these communities were ultimately answerable in theory to the King, or Ard Righ, based in the South of Scotland, but, in most cases, were left to their own devices. Some of them prospered while others declined. Clan Donald power ebbed as the Campbells of Argyll rose in patronage. In the South of Scotland, Lowland families followed suit. (“Clan” simply means “Family” in the Gaelic language). Again, the Borders proved hard to control with the Johnstones, the Elliots, the Kerrs and the Maxwells continually at odds with one another. Inevitably, it was only the threat of an English invasion which brought them together. However, when the time came, it was the fiercely independent clans of the North that rallied in support of the Royal House of Stewart. Under the rules of the ancient Clan system, it was unthinkable for the rightful heir to the Throne of Scotland (and England) to be passed over in 1714 for a German prince by a remote and alien English parliament. Their ultimate reward was annihilation in 1746 on the Battlefield of Culloden Moor. For a time it looked as if the pride of the Highland Scot had been crushed forever, but as the British Empire expanded, and increasingly more Scots became pioneers in the New World of the Americas and Australasia, the brotherhood of the clans was re-born. In the following pages I have attempted to provide a taste of the Clans and Families of Scotland, old and modern. There is obviously so much more to them than this, but for those who are proud of their Scots ancestry and want to find out more, let's just say that this is only the beginning.